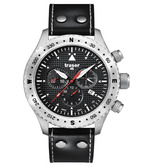 Traser watches are made for those that need a tough, durable watch that will last. 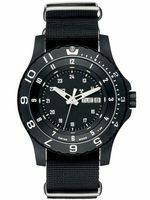 Traser tactical watches stand the test of time in extreme conditions, they use tritium technology that allows them to self-illuminate and glow for up to 20 years. You will notice that they are 100 times brighter than normal, illuminated watches, making them perfect for nighttime use. Traser military watches are not just built to last, but are constructed to withstand harsh conditions and challenging environs. Many of the Traser watches we offer come with a NATO watch strap, waterproof build and are crafted to the highest Swiss quality standards. We offer a wide inventory of watches for sale with fast same business day shipping, satisfaction guarantee and all of the benefits of purchasing from an Authorized Dealer in the USA. Trigalight has many uses in the military, but most civilians see it used on the dials and hands of watches. These watches are easily read even in complete darkness and are popular with emergency workers. Trigalight is perfect in this application because the "glow" does not fade throughout the night but is steady at all times. This bright illumination is guaranteed for a minimum of ten years, and requires no batteries, charging, or maintenance to keep the lights on. Manufacturing of a trigalight tritium tube is a patented process is licensed worldwide by only one company, mb-microtec. It uses radio luminescense for self-illumination to make products which are lighted with no external energy source - no charging, no cables, no batteries - ever. Using modern micro-technology, mb-microtec makes and laser seals tiny glass tubes (as small as 0.5 mm in diameter and 1.3 mm in length). The inside of the tubes are coated with a luminous substance. Each tube is then filled with tritium gas (a hydrogen isotope). As the gas decays, it emits electrons which strike the coating and make it light up. The lights themselves are available in eight colors. All eight colors use the same tritium gas, but a different coating on the tube itself. Green light is the most commonly used, as it appears brightest to humans. Traser traces it roots back to 1918 and their research in radio luminescence safety has been ongoing since then, almost 100 years now. Tritium gas is extremely safe: the emitted particles, though radioactive, are stopped by something as simple as a sheet of paper and they do not penetrate skin. According to mb-microtech's research, "A calculated example shows that consuming 1 banana every other day causes the same dose as breaking a trigalight equiped watch (1GBq of activity) and absorbing 100% of it's tritium content." Trigalights are also used as tactical inserts. The light is encased in a metal sleeve and uses a sapphire crystal to disperse the light. Economy inserts are also produced and are encased in a plastic shield and the sights installed with silicone glue and are effective for day visibility.